Pioneers in the industry, we offer epofit 10k from India. 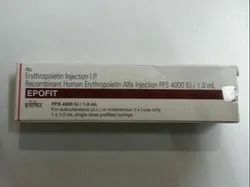 Epofit 10000 IU Injection is an erythropoiesis-stimulating agent (ESA). It works by stimulating the bone marrow (soft tissue inside the bones which produces red blood cells) to produce more red blood cells. Looking for Kidney Infection Drug ?